When administrators at Henry Ford Medical Group agreed to provide free cancer treatment for about a dozen uninsured Detroit-area patients, they never expected it would cost $3 million. Exasperated, they took out their calculators to figure out what made the care so expensive. "Amazingly, two-thirds of that was drug costs," said Dr. William Conway, CEO of the medical group. "We were pretty floored by that." 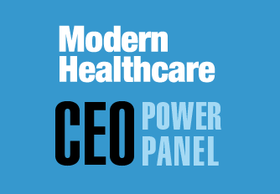 More than 60% of CEOs, including Conway, cited drug costs when asked to predict their fastest-growing expense in 2018, according to Modern Healthcare's latest CEO Power Panel survey, a quarterly polling of some of healthcare's most prominent leaders. That answer eclipsed the runner-up, staffing and labor costs, at 20.9%. 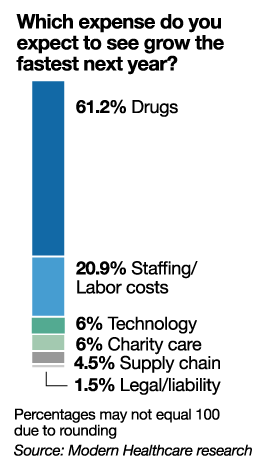 Technology, charity care, supply chain and liability expenses trailed even farther. It's hardly news that administrators are sweating over high drug costs—they've voiced such concerns in previous surveys as well—but some industry leaders describe today's environment as approaching what could be a breaking point. "The providers can't withstand price increases that are multiples of overall healthcare inflation," said Joseph Fifer, CEO of the Healthcare Financial Management Association. "Something is going to give here at some point. It can't go on forever." A potential source of disruption surfaced last month when four not-for-profit health systems said they plan to start their own generic-drug company. One of the systems involved, Livonia, Mich.-based Trinity Health, spent $16 million more on drugs last year due to price hikes alone. 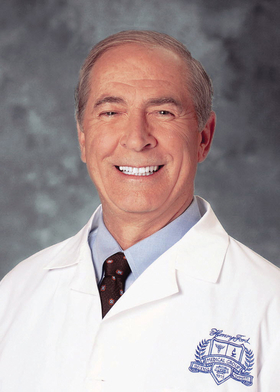 CEO Dr. Richard Gilfillan said in an interview that Trinity lately has struggled to keep its shelves stocked with even simple pain medications. 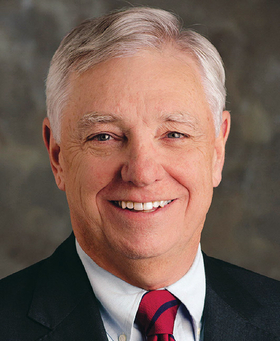 Creating a generic-drug maker is also meant to help prevent shortages that endanger patients, Gilfillan said. "One thing we've said is, 'We will not accept a world in which it's easier to have morphine kill people on a street corner than save lives in ICUs,'" he said. "That's literally what's happening." For his part, Fifer said he thinks 2018 will bring more examples of providers turning to innovative partnerships to tackle rising drug costs. But he's not sure they'll be able to stem the tide on their own, given the sheer complexity of the problem, and especially as drugmakers argue that high prices are necessary to fund research and development. Drug prices at Texas Health Resources' acute-care settings increased by 8% last year, and Barclay Berdan, CEO of the Arlington, Texas-based system, doesn't expect that will change much this year. He said he'll be watching the four health systems' efforts to launch a drug company, but cautioned it's going to be challenging to make headway. A pair of hurricanes that crippled Puerto Rico in September 2017 exacerbated an existing shortage of IV fluids nationwide. Dozens of damaged drug manufacturing plants with operations on the island struggled to get back online. Scripps Health is among the systems feeling the effects of the ongoing IV fluid shortage, and CEO Chris Van Gorder said he suspects it's not just the result of natural disasters. In his 40 years in healthcare, Van Gorder said he's never seen shortages happening this frequently. He also believes drugs will be the San Diego-based system's fastest-growing expense this year. He suspects consolidation among drug manufacturers, and a resulting lack of competition, is at least partially to blame. Dr. Marc Harrison, CEO of Intermountain Healthcare, Salt Lake City, another of the four not-for-profits launching the drug company, also expects pharmaceuticals to be his system's fastest-growing expense. Harrison said, however, that creating the drug company is more about preventing shortages than lowering costs. On the latter point, Harrison said he's in talks with pharmaceutical companies that have been receptive to implementing value-based arrangements around the most expensive medications. One way that might be effective is if expensive biologics don't work, the health system or patient won't have to pay for it, he said. Another possibility: capitated, flat-rate agreements for drugs based on the number of patients in a health system. The system hasn't yet entered those contracts, but Harrison said he's hopeful it will by the end of this year. "Anything we could do to take some of the volatility out of what happens with drug pricing would be good for us and our patients," he said, "and would give some predictability to our colleagues in pharma." Inpatient drug costs per admission shot up nearly 40% between fiscal 2013 and 2015 at Edward-Elmhurst Health, a three-hospital system based in Naperville, Ill., in Chicago's western suburbs. The system's overall pharmacy costs increased 14% last year, most of that from chemotherapy drugs and medications for neurological diseases and blood disorders, said Mary Lou Mastro, Edward-Elmhurst's CEO. To fight back, Mastro said the system works with a group purchasing organization to limit price increases and has a team that monitors utilization and looks for substitutions. Beyond that, though, she said there's not a lot providers like Edward-Elmhurst can do. "It's just out of our control," she said.